The Vaude Tool saddlebags (seat bags) offer a variety of sizes to fit you and your bike just right. All of the bags also have a handy gusseted bottom zipper compartment to instantly expand the carrying capacity of your saddlebag. The twist adapter attachment system is quick and easy to use, just twist the bag, and it will glide right off the twist system. Use the Velcro™ straps to ensure no rattling. Carry your tools, a tube, a patch kit, and whatever else for the bag that fits you right. 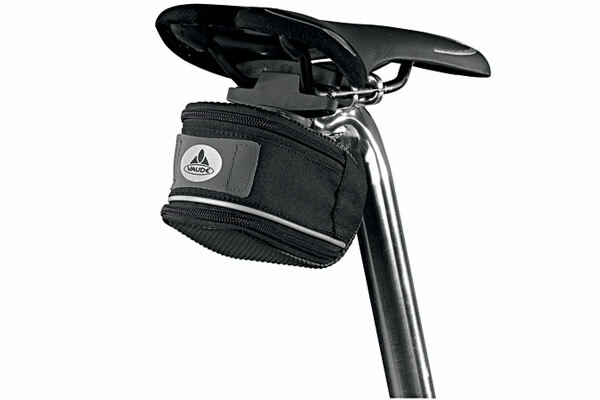 Have your quick fix items near with the Vaude Tool saddlebag.